Leo is one of the earliest identified constellations in historical records. The Sumerians named the constellation in 3000 BC. 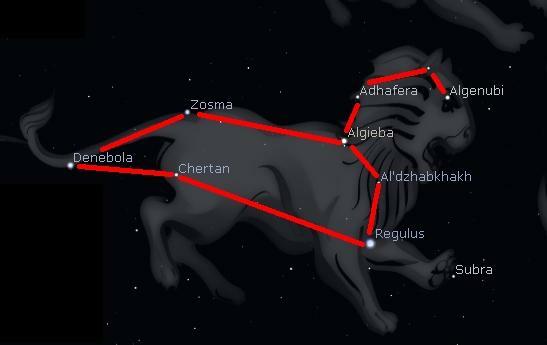 While different cultures gave the constellation different names in their language, they all translate to ‘lion’ in English. According to mythology, Leo is the lion that Hercules vanquished as one of his 12 tasks. Leo contains several notable stars. Regulus is the brightest star in Leo and forms the base of the sickle or backwards question mark, that is Leo’s head and chest. Regulus is the 21st brightest star in the night sky and is about 80 light years distant. A light year is the distance that light travels in one year, about 6 trillion miles. Al Gieba is the bright star in the curve of the sickle and means ‘the forehead’ in Arabic. Al Gieba is 130 light years distant. Denebola is the star at the back of Leo and means “tail of the lion’ and is about 36 light years distant. If you imagine the tail curving up and away from the body, you will see a naked eye star cluster. Historically, this is the tuft of Leo’s tail. Today, it is in a separate constellation called Coma Berenices and is known as the Coma Star Cluster. Berenices was the wife of Ptolemy the Third, king of Egypt. The constellation represents her hair. There are several galaxies in Leo, visible in telescopes. Ask to see The Leo Trio, if you attend an astronomy sky-viewing event in early summer.